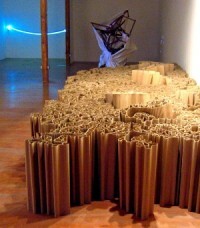 VINEspace presents four sculptors. 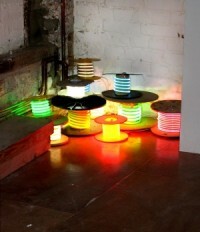 Richard Box exploits the qualities of neon light to express incongruous relationships. 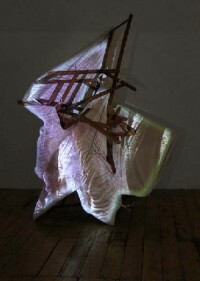 Light and movement using video are integral to Laura White’s work. Howard Silverman works with material of a temporary and throwaway nature, whilst Seamus Staunton makes quietly considered objects from wood. Richard Box is best known for his installation work ‘Field’, comprising of 1300 fluorescent lights planted in a field, off the M4, near Bath. The lights were powered by the emissions from overhead power lines. At VINEspace, he mimics functional objects such as spools of wire, an electric hob and a rope positioned as a barrier, to create lyrical copies bereft of function. His sign above the door, similarly, makes nonsense of something intended to be useful. 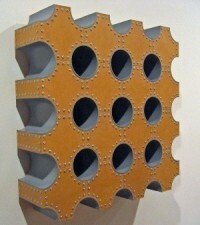 Laura White projects video images onto objects. ‘Deck’ is a simple, sculptural assemblage of deckchairs and canvas that becomes something more unusual as an image sinks into and across its surface. ‘Blue Light’ is different  a ‘ready-made’ lamp-stand is unapologetically itself, and remains just that, whilst being decorated with the twitching image of an eagle. Howard Silverman’s pieces have been realised as many things: installations, sculpture, landscapes, digital images, journeys, but essentially they are drawings. The material enables him to be spontaneous in his approach to any given space and here, the result is a complex mass of shape and line that wants to be landscape and yet by virtue of its scale and context cannot escape its ‘objectness’. Howard has recently been invited to make a new installation for the Lowry Centre in Salford, which goes on show in May 2006. Seamus Staunton’s hollow wall pieces have a sculptural sentience derived from an interest in the potency and structure of music and sounds  for example, he attempts a sculptural equivalent of the experience of hearing a musical note. This experience is pure and intense, but ultimately ephemeral and lost. The work appears robust and compact, but at the same time depends on internal modules of space and air to punctuate and regulate structural integrity.